HUDSON, MA July 12, 2017 – , Facilis, a leading international supplier of cost-effective, high performance shared storage solutions for collaborative media production networks, today announced that Toronto-based Telelatino Network Inc. (TLN) has standardized their entire both production and post-production storage infrastructure on Facilis shared storage systems. Based in Toronto, Ontario, TLN, is a general interest service that broadcasts a wide variety of domestic and international programming including drama, variety, lifestyle, news and sports. Over the years, TLN has evolved from its origins as an Italian and Spanish language channel, to appeal to a wider segment of Canadians with an English language stream of culturally connected programming. TLN also develops and produces a wide variety of TV and digital media productions which are distributed in Canada on its own TV channels, and worldwide on online platforms and to third parties. Additional channels offered by TLN include 6 All-Spanish language TV channels (Univision Canada, TeleNiños, Cinelatino, Centroamerica TV, WAPA America, Television Dominicana), 3 All-Italian language channels (Mediaset Italia Canada, Sky TG24 Canada, TeleBimbi), and an English language sports channel (EuroWorld Sport). TLN has a large studio and control room where they create shows, promos, and some commercials in-house. 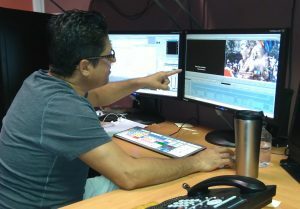 The post-production department is based around Avid Media Composer editing suites connected to Facilis TerraBlock shared storage. When TLN switched to HD six years ago, they knew they needed more storage capacity. They purchased another TerraBlock at that time since editors were consuming the space very fast. Two years ago, they purchased an additional chassis with 24 terabytes of storage for the editing team. Over the years, there had been a collection of different storage systems in use at TLN from different brands being used for various functions. Having different storage systems in the facility was inconvenient, as it required operators to move media between storage chassis. This not only took extra time, but also impacted the network bandwidth with so much traffic flowing in and out of the various systems. With the success of the Facilis systems in post-production, and the need to replace a discontinued MediaGrid storage system, Gherman and his colleagues decided to standardize on Facilis as their main storage platform for both production and post-production. Gherman contacted Don Kinzinger at Dynamix, a local Facilis reseller in Toronto, and TLN added a new 192 TB chassis to their existing TerraBlock servers a few months ago. Now, TLN has a large central, unified storage network for the whole facility which saves transfer time and has reduced their overall network traffic. Currently, TLN has five Avid suites connected to the TerraBlock, plus two seats running CAT DV for archiving of material, and another seat for general purpose administration needs. Having worked with other storage systems that require a great deal of knowledge and understanding of Linux, Gherman appreciates the ease of administration when creating, deleting or resizing volumes on a TerraBlock server. “From our point of view, Facilis represents the perfect combination of price, quality and reliability. It just keeps running and running, day after day, and we like that we don’t have to worry about our storage,” he concludes.